After hitting the British underground scene back in 2015, a hype grew rapidly for the punk-hip hop offerings of Rat Boy (aka Jordan Cardy). Enough for Kendrick Lamar to sample him in Lust from 2017’s DAMN. Early work also caught the attention of long-term inspirational source and L.A. punk veteran, Tim Armstrong (Rancid, Operation Ivy, Transplants), who decided to team up with and produce Cardy’s sophomore LP, Internationally Unknown. In Internationally Unknown, Rat Boy strips back the loosely skate-punk dynamics of 2017 debut LP Scum, building on an organic blend of carefree, attitude soaked punk and some dope hip hop beats for a neat fusion of the duo. There’s defiant vocals over a brew of anthemic punk and energetic hip hop pieces, with some distinct scatterings of two-tone ska and reggae flavours throughout. Stylistically, it’s reminiscent of early Rat Boy, but that British punk sound of earlier releases has evolved into a more Cali punk influenced sound. It’s different but existing fans are unlikely to be disappointed. From energetic bratty, opener Chip On My Shoulder, Internationally Unknown is an eclectic selection of tracks that epitomize the individuality of punk and hip hop. The punk rock roots of the album are dominant in opener Chip On My Shoulder and throughout in tracks like Flies, eponymous track Internationally Unknown or So What. On the other hand, chilled-out Night Creature (feat Aimee Interrupter of the Interrupters) sees things toned down for more of a dancehall skank vibe. My Name Is Ray Boy shifts closer to reggae beats with some sinister guitar work, while Silverlake sees a return to punk roots to end with an energetic closer. 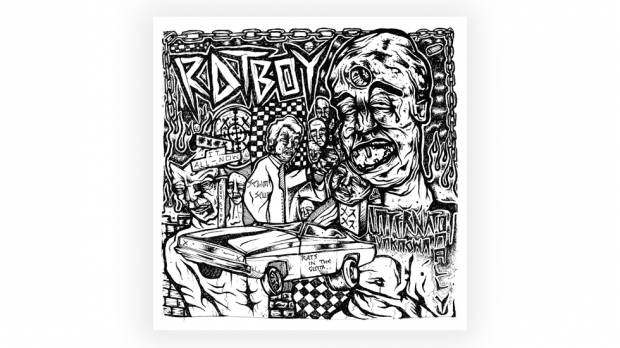 Armstrong’s influence on Rat Boy and Internationally Unknown is clear throughout the album, with strong similarities to the Cali punk/hip hop style of The Transplants. Most prominent in nostalgic tracks Don’t Hesitate and No Peace No Justice, the latter even features vocals from Armstrong. Tracks like Flies and Dad’s Crashed Car are akin to early Green Day while scatterings of the Beastie Boys can be heard amongst many tracks. Throughout much of Internationally Unknonwn, Cardy’s vocals are reminiscent of Armstrong’s, leading listeners to double take who they’re listening to at times. The punk/hip hop fusion may not be everyone’s cup of tea, but it’s this unexpected convergence of the two genres that makes Internationally Unknown something worth listening too. It’s not typical punk and it ain’t typical hip hop, it’s an obscure fusion of attitude and rebellion with a carefree aesthetic that’ll have you appreciating its nostalgic qualities. While Rat Boy has remained relatively unknown on the shores down under, Internationally Unknown might just make his mark on the map. It hits a sweet spot that’ll leave a long running tune in your ears and a little thrash or skank in your step.